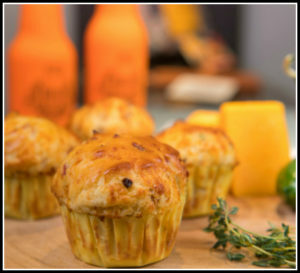 Image of Jalapeno, Bacon, Cheddar Cheese Muffin taken for the Beer Institute. Recipe was created by Chef Laurent Aubel. Preheat the oven to 350° F. Grease two 12 cup muffin pans or line with paper cups. In a medium bowl, stir together the flour, baking soda, baking powder and salt. In a separate bowl mix sugar, butter, eggs, buttermilk and lager beer with a mixer until smooth. Pour in the dry ingredients and mix by hand just until blended (don’t over stir). Fold in cheddar cheese, bacon and jalapeno until combined. Spoon the mix into the prepared cups, filling almost to the top. Bake in preheated oven until the tops of the muffins spring back when lightly pressed, approximately 25 minutes. Cool in the pans for at least 10 minutes before removing.